Maplewood Field House Expansion & Renovation Project : Ribbon Cutting Event Date TBD! Maplewood Park's new Field House is scheduled to break ground in August of 2018. Construction is scheduled for one year. This 600 square foot building serves as a place for children's classes, community events, and Chicago Park District offices for staff. The building dates to the 1950's and is in need of many upgrades. What was the last thing you or your family outgrew? How did it feel? What did you do? Please help our neighborhood continue to grow and thrive as we work together to expand and renovate the Maplewood Field House. Share our cause through social media: Please, help us spread the word! We cannot fundraise without the help of many, and that includes you! Copy the address above and share on your social media, let friends and family know that this is a HUGE project to benefit a wide community for a very long time. Corporate Sponsorships, Matching Funds, and In-Kind Donations: Email maplewoodandlucyflowerparks@gmail.com and let us know if you are interested in discussing a partnership. Contact your employer to learn if your company will match your donation. In Memoriam: A contribution to Maplewood Park's Field House Project is a lasting way to improve the community while honoring a loved one. Please email us and we will work with you to create a lasting and meaningful legacy in our updated park. The Maplewood and Lucy Flower Park Advisory Council (MLFPAC) is a volunteer group of neighbors. The PAC meets monthly to represent the needs of the community to the Chicago Park District, improve the quality of parks through programming, scholarships, and garden clubs, and provide counsel regarding safety, maintenance, and upkeep. What was the last thing you or your family outgrew? How did it feel? What did you do? Here at Maplewood Park, we are packed in tightly and we need to grow to reach our fullest potential. The Maplewood Park Field House Expansion and Renovation Project needs your help. 1.4 million is already raised by neighbor volunteers leading the way! $100,000+ raised by neighbors just like you! What teamwork! In cooperation with the Chicago Park District, First Ward Alderman Proco Joe Moreno, and Friends of the Parks, we are pleased to announce that we are making this 1.5 million dollar project a reality. Maplewood Park and Maplewood Field House are located in the West Bucktown / Humboldt Park neighborhoods of Chicago. Maplewood Park's Field House plays host to a variety of Chicago Park District programs and community events. This aged, 600 square foot building dates to the 1950's; while the building is consistently at capacity for programs, it is not ADA compliant, lacks energy efficiency, reliable plumbing and cooling, and is a poor use of the available park space. As the demography of our area has changed, we have seen a marked influx of families and businesses. Community events are regularly attended by hundreds of neighbors, free of charge, such as Night Out in the Park's School of Rock, Movie in the Park Nights, and the Crafty Mobile. The Chicago Park District works with the volunteer organizations Maplewood and Lucy Flower Park Advisory Council (MLFPAC) and West Bucktown Neighborhood Association (WBNA) along with First Ward Alderman Joe Moreno to provide additional community events such as the Earth Day Clean and Green and the Annual Easter Egg Hunt. An expansion and renovation of the Maplewood Field House will make it possible for these types of events to continue and grow, unifying neighbors, local organizations, and local businesses. We have also seen neighborhood children start in Park District programming (ages 2-6) only to quickly age out, with few local and affordable options for extra-curricular learning, physical and social development, and safety. 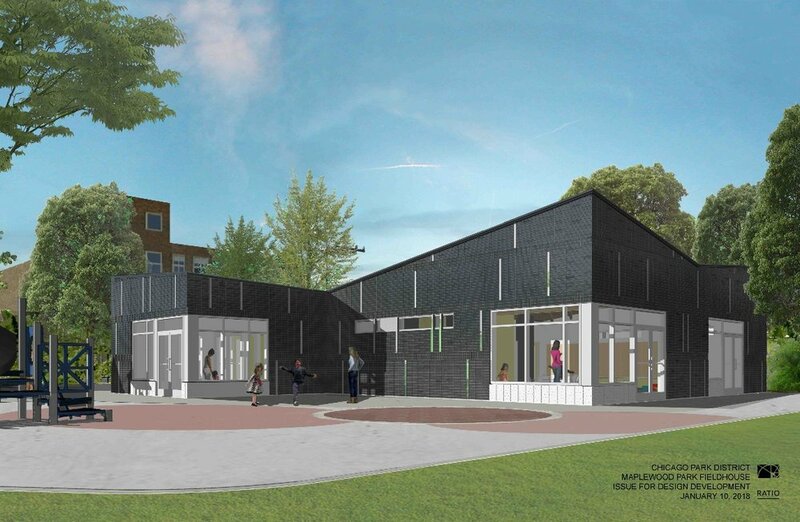 With a larger facility, Maplewood Park Field House will be able to accommodate greater varieties of classes and mentorship programs, focused on children ages 6+. These classes will be educational, fun, affordable, and help children develop bonds within their neighborhood while growing new friendships. As usual, scholarships will be available every season. We are grateful to Chicago Cubs Cares and LISC Chicago for the $85,000 grant award (2017) to fully renovate Maplewood’s derelict ball field. We look forward to all that a functioning ball field will support. We also wish to thank the decades of volunteers who’ve lead by example, raising funds for Maplewood’s two play structures, new benches, bird houses, and more. Thanks for rolling up your sleeves and making beautiful community gardens, looking out for the park, cleaning up after others, giving your time and energy to the benefit of all. Thank you for supporting the Maplewood Park Field House Expansion and Renovation Project. You are providing new opportunities for growth, learning, development, leadership, community building and more. Please spread the word and join our cause--we cannot achieve our goals and continued growth without the help of many. Thank you to the Chicago Park District and First Ward Alderman Proco Joe Moreno for the 1.4 million of support!